[Henrik MOHN (1835-1916), Georg Ossian SARS (1837-1927), Carl Frederik WILLE (1830-1891) and others]. Den Norske Nordhaus-Expedition... The Norwegian North-Atlantic Expedition Oslo: Grondahl & Sons, 1882-1901. 7 volumes, 2° (358 x 272mm). Parallel titles and text in Norwegian and English. 303 lithographic plates, maps, views and tables, most tinted, 5 double-page, 1 folding. (Some light soiling and old creasing.) Contemporary half calf, spines gilt, red morocco lettering-pieces to spines (volumes III and VII bound to style in modern half-calf bindings). Provenance: Royal Society of Edinburgh (various early ink stamps). The complete series of official reports on the three seasons spent exploring the North Atlantic or Norwegian Sea aboard the Vöringen, from Iceland in the west to Jan Mayen, Spitzbergen and the Arctic circle in the north. The expeditions concentrated on deep-sea oceanographic observations in the Norwegian Sea. 1. a. 'Historical Account' by C.Wille, , 46pp., lithographic map. b. 'The Apparatus, and how used' by C.Wille, , 54pp., wood-engraved frontispiece, illustrations. c.'1.Astronomical observations.H.Mohn. 2.Magnetical observations. C.Wille. 3.Geography and natural history... H.Mohn', , 36pp., 6 mounted chromolithograpic views, 2 maps, illustrations. d.'Chemistry' by Hercules Thornoe, , 76pp., 3 coloured lithographic maps, illustrations. e.'Chemistry' by Ludvig Schmelck, , 16, 71pp., 2 coloured lithographic maps. 2. a. 'Meteorology' by H.Mohn, , 150pp., 3 lithographic tables, one map. b. 'The North Ocean, Its Depth, Temperature and Circulation' by H.Mohn, , 212pp., 21 lithographic tables, 27 lithographic maps, one folding. (Tear to folding map, final map creased). 3. a.'Zoology. Fishes' by Robert Collett, , 164, pp., lithographic map, 5 double-page lithographic plates, illustrations. (Some light soiling). b.'Zoology. Annelida' by G.Armauer Hansen, , 53, pp., lithographic map, 7 lithographic plates. c.'Zoology. Spongiadae' by G.Armauer Hansen, , 25, pp., 7 tinted lithographic plates, lithographic map. (Some light creasing to final 5 plates). d.'Zoology. Mollusca. I. Buccinidae' by Herman Friele, , 38pp., 6 lithographic plates, lithographic map. e.'Zoology. Mollusca. II' by Herman Friele, , 44pp., 6 lithographic plates. 4. a.'Zoology. 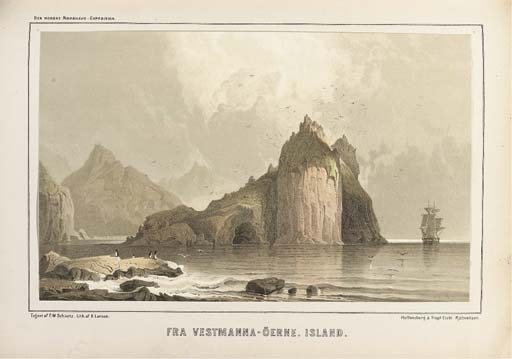 Gephyrea' by D.C.Danielssen & Johan Koren, , 58, pp., 6 tinted lithographic plates, lithographic map. b.'Zoology. Holothurioidea' by D.C.Danielssen & Johan Koren, , 94, pp., 2 lithographic plates, 11 tinted lithographic plates, lithographic map. c.'Zoology. Asteroidea' by D.C.Danielssen & Johan Koren, , 118, pp., 15 lithographic plates, 14 tinted, one printed in colours, lithographic map. d.'Zoology. Pennatulida' by D.C.Danielssen & Johan Koren, , 83, pp., 12 lithographic plates, 10 tinted, 2 printed in colours, lithographic map. 5. a.'Zoology. Alcyonida' by D.C.Danielssen, , VIII, 169, pp., 23 tinted lithographic plates, lithographic map. b.'Zoology. Actinida' by D.C.Danielssen, , II, 184pp., 25 lithographic plates, 19 tinted, 6 printed in colours, lithographic map. c.'Zoology. Crinoida' by D.C.Danielssen, , 28pp., 5 tinted lithographic plates, printed lithographic map. d.'Zoology. Echinida' by D.C.Canielssen, , 9pp., tinted lithographic plate. e.'Zoology. Ophiuroidea' by James A.Grieg, [2 (?of 4)], 41pp., 3 tinted lithographic plates, lithographic map. 6. a.'Zoology. Crustacea, I' by G.O.Sars, , 280, pp., 21 tinted lithographic plates, lithographic map. b.'Zoology. Crustacea, II' by G.O.Sars, , 96pp., lithographic map. (Some light old creasing). c.'Zoology. Pycnogonidea' by G.O.Sars, , 163pp., 15 tinted lithographic plates, lithographic map. 7. a. 'Zoology', 10 articles by various authors, , 27; , 16; , 23; , 15, ; , 72, ; , 103, ; , 30, ; , 13, ; , VIII, 131pp., 22 lithographic plates, 5 lithographic maps. b.'Botany. Protophyta, [etc.]' by H.H.Gran, , 36pp., 4 lithographic plates.